PRS has announced the release of the new PRS SE Zach Myers Signature model ahead of NAMM 2014. The guitar - the second SE to bare the Shinedown frontman's name - is a chambered take on the Singlecut model, featuring 22 frets, a Wide-Fat neck with a traditional 24.5" scale length and two PRS 245 humbuckers. Pricing is yet to be confirmed, but the guitar will come with a maple cap and flame maple veneer in a satin Trampas Green finish. 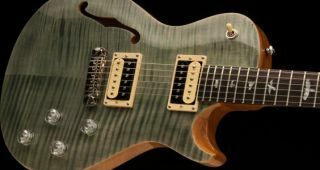 Zach Myers plays and talks us through the new guitar in PRS' video above. Total Guitar will be at the NAMM show in January, where we'll be bringing you more information on al the latest new gear releases from the show.